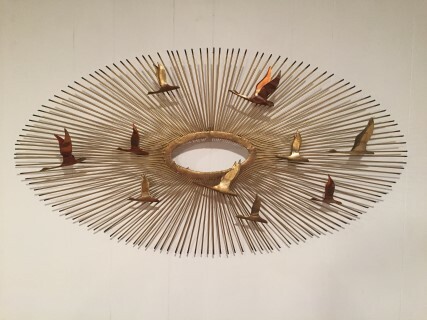 This ethereal 1968 ‘Birds in Flight’ brass and copper wall sculpture by metal artist Curtis Jere depicts a spoked sunburst with ten geese in various positions of flight. This piece is an iconic and classic Mid-Century design and is in excellent vintage condition. Measuring 38 inches across and 20 inches high, this piece stands out from the wall about two inches and casts great shadows. There is a hanger on the back to display this creative piece of wall art.